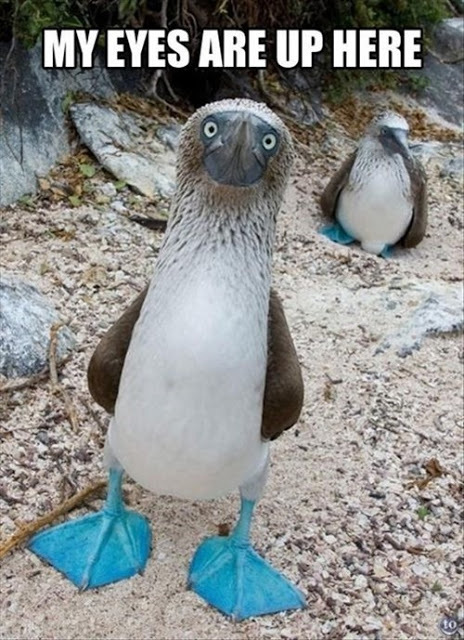 Humor by Nature and Man – Blue-Footed Booby! It is hard not to be drawn immediately to those blue feet and what a color of blue they are! As it states at the referenced link below, it is a bit of coincidental humor to be named a “booby” and have those feet! We recently spent ten days hiking the trails of Yellowstone National Park. This was a bucketlist item for us and we were thrilled to be able to check off this box. Although we are senior citizens, we logged more than seventy miles along the pathways and mountains of this beautiful and intriguing geographical area. We were enjoying the beautiful meadows and wooded areas while hiking to Cascade Lake. There were bison in the area (more about that in a later post) and while photographing and admiring these large animals, I saw a silhouette of the bird below. At first it appeared mostly black. I took several steps closer to get a better look and rather than a raven as I originally thought, I knew this was a falcon or a hawk. What I normally do in this situation is I take several pictures while moving a bit closer for each click of the shutter. In this way, I hope to capture shots that will enable me to identify the bird without chasing it away. This was a very confident bird. As you can note, it was clearly perched in an open and perhaps vulnerable spot. As I moved a bit closer, it did not move on inch. 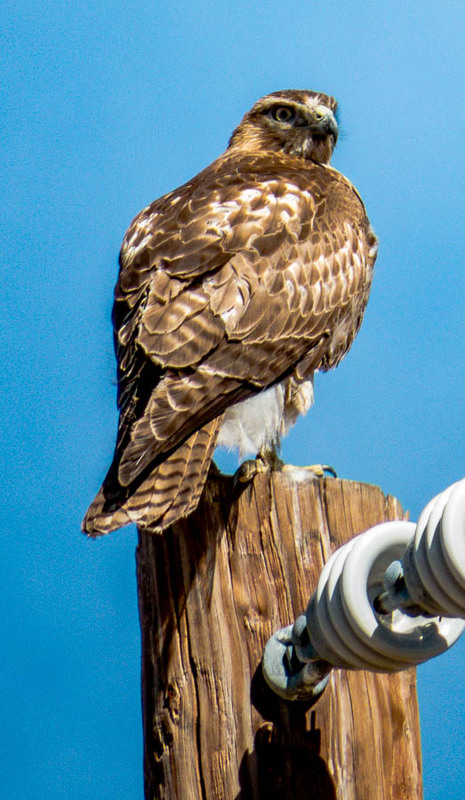 The only change in posture was for this hawk to turn its head to look at me. I always try to respect the animals I photograph by giving them plenty of room. I do not get very close because, after all, this is their home and I do not want to frighten them or change their behavior. I try to observe from a distance. I have a Canon bridge camera which does allow me to get fairly close with an equivalent 600mm lens. After trying to identify this bird, I thought it might be a Harris Hawk, but as I normally do when I am unsure, I post a question in the Bird Identification forum on the BirdForum website. If you are interested in birding or bird identification, I cannot recommend this resource more highly. The members are very helpful in guiding novices to learn how to properly identify birds. 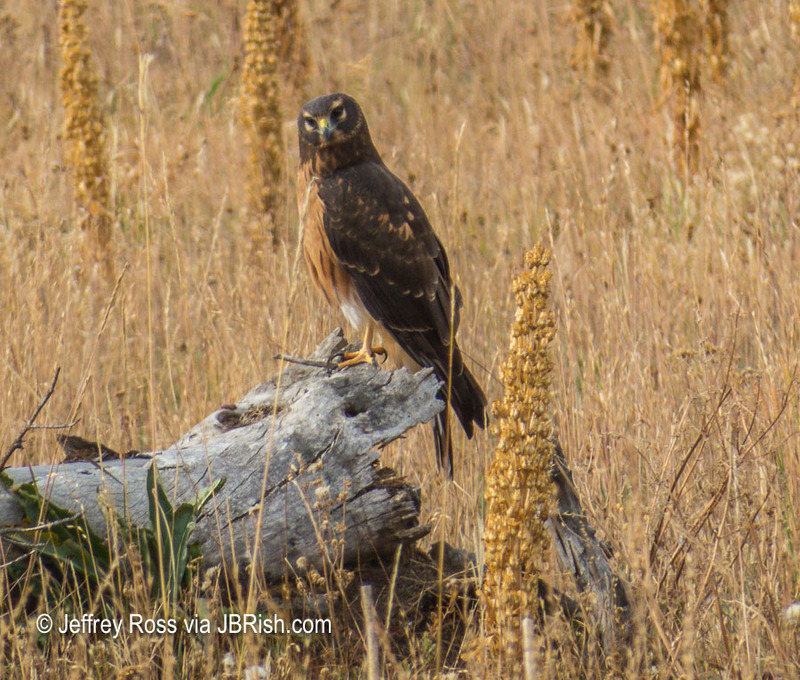 After making my guess and posting the three pictures from this post on the forum, I learned that this was a Northern Harrier Hawk and that the facial markings, referred to as a mask, is the clincher in this identification. 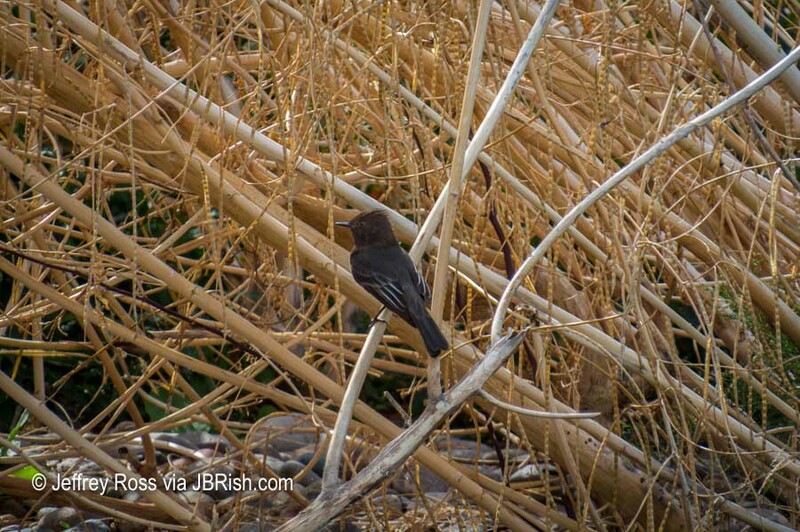 This was a bird that I had seen from a very far distance in Arizona, but I did not have a photograph of it. 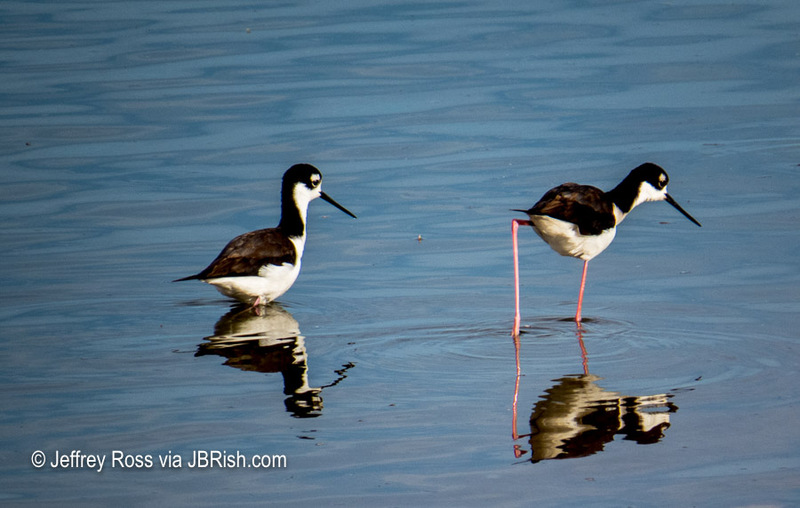 I was glad to add these photos to my birding collection. 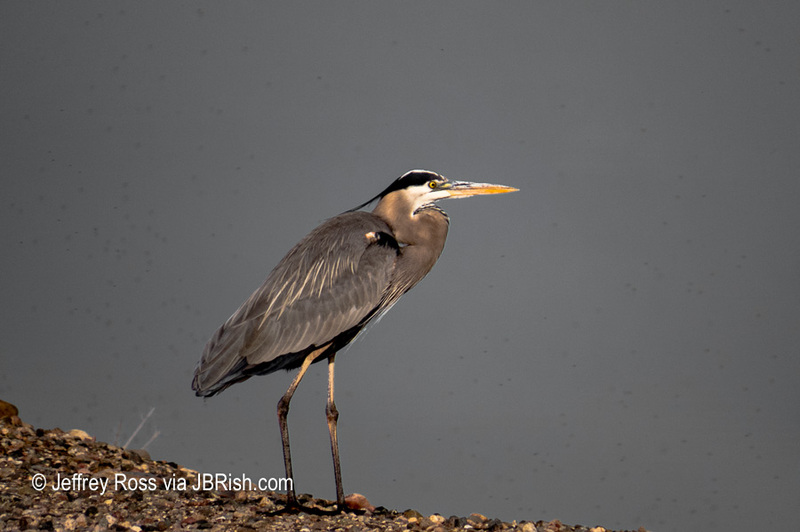 I now have seen and identified more than ten percent of all birds that visit North America some time during the year according to the American Birding Association (ABA). Check out the BirdForum if you have in interest in birds and/or birding. 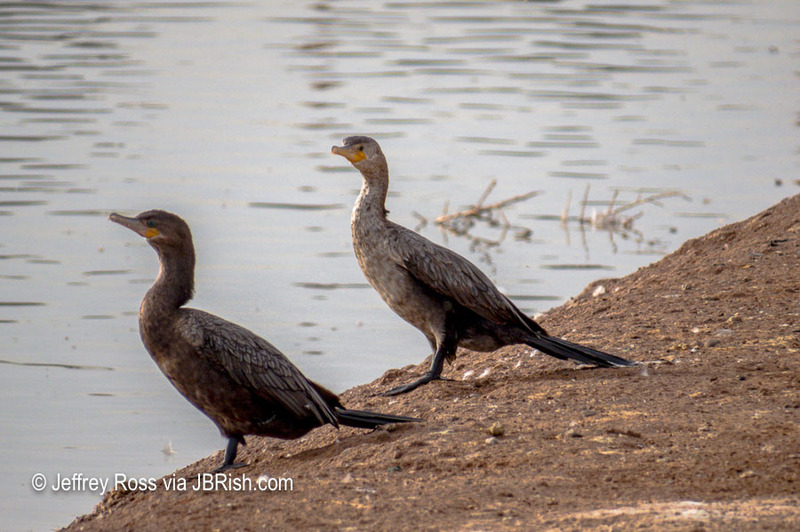 To read more JBRish.com posts about birding, click HERE. 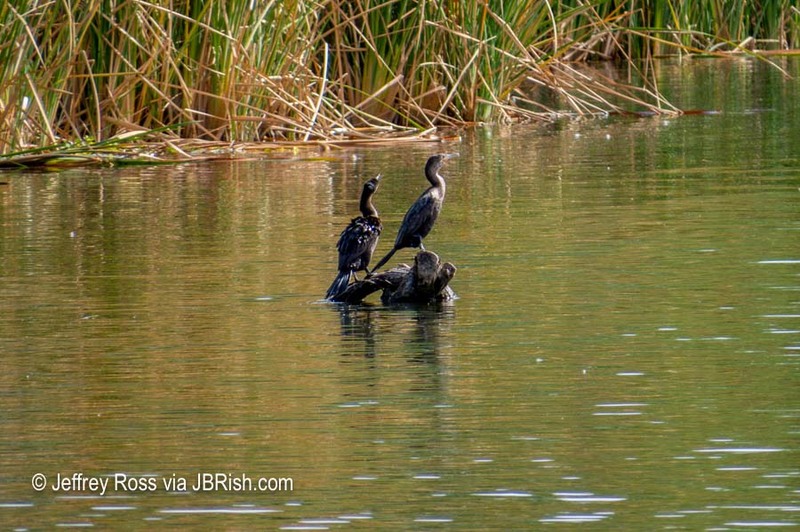 As we continued our walk and circled around the pond, we came across several Cormorants sunning themselves. 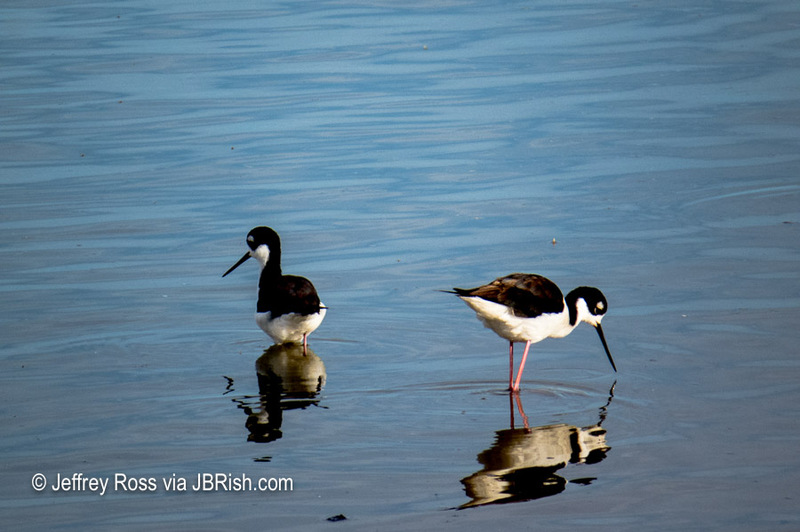 I usually associate these birds with shorelines, but they were probably just passing through. 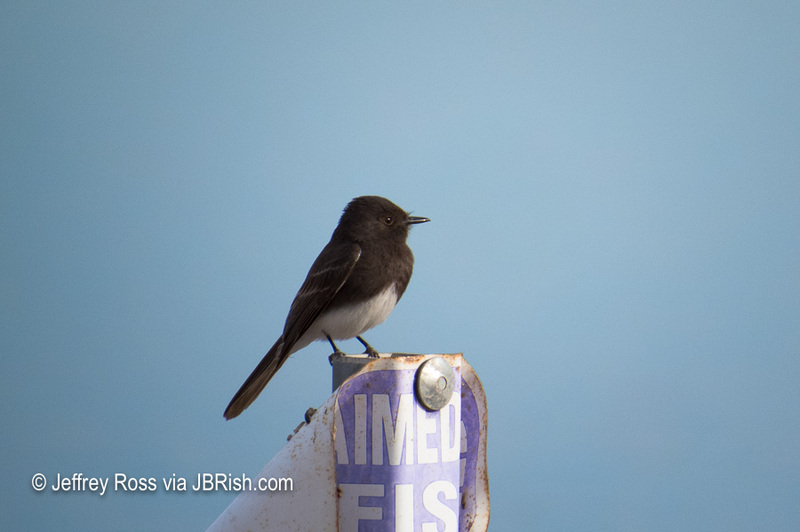 As we returned to the parking area where our car was located, this Black Phoebe was sitting on top of a no fishing sign. It didn’t say he couldn’t catch flies! 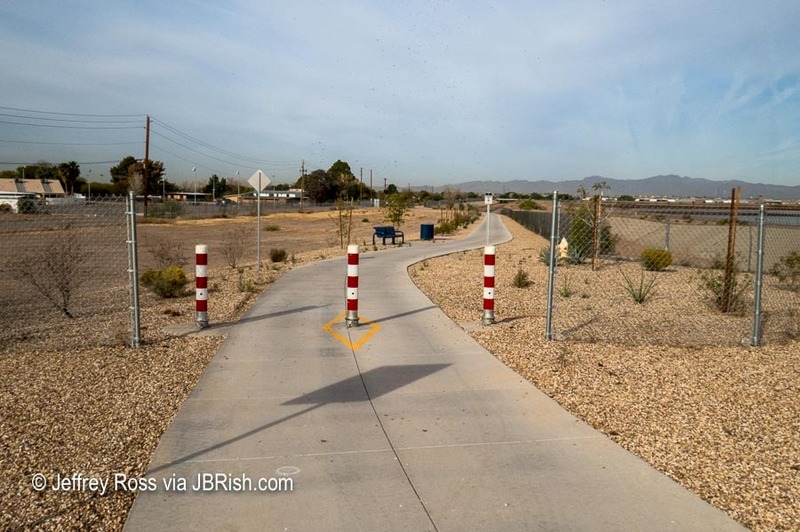 The southern boundary of the recharge pond park, had a nice wide path for walkers and bikers. Having had enough gnats and/or flies, we headed back to our car. We did not anticipate that a good number of the annoying recharge pond denizens would want to hitch a ride with use, but pack into the car they did. 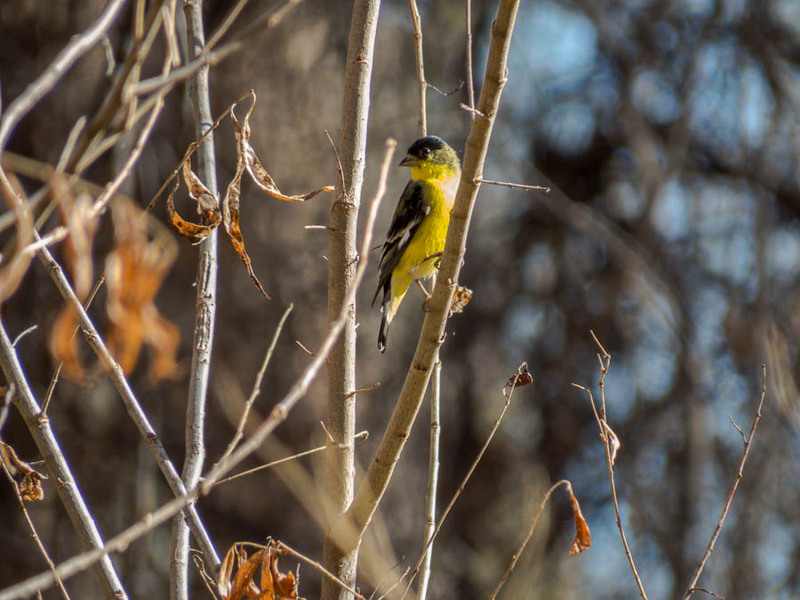 The morning was moving on and the prime bird watching window was closing, so we decided to head to the Tres Rios Base & Meridian Wildlife Area which often attracts a variety of birds. Our GPS led us a bit off course, but we finally made it. 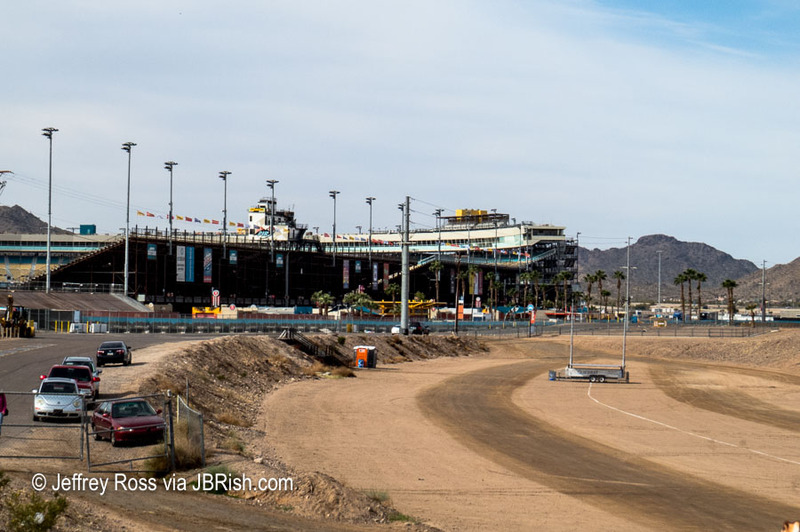 It is located very near the ISM Raceway, South Phoenix. There was no event at the racetrack so parking was wide open. We parked along the side of the road and walked through the gate toward the river inlet. While the water was not “raging,” it was moving well. Several people were fishing as we walked along the riverbank looking for birds. We could see movement in the trees and we knew there were birds in the distance, but I am not skilled enough to be able to identify them by song. I would need a relatively good visual sighting to confidently ID a bird. I did spot another Phoebe waiting in the tall, dried grasses. Not having much success finding birds to identify, we decided to leave. 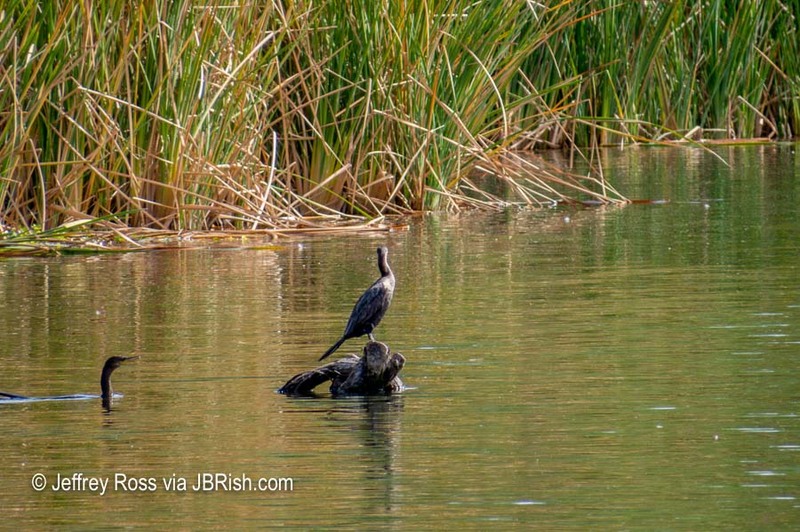 As we made our way to the parking area, we spotted a Cormorant sunning on a partially submerged log. He wasn’t alone long as a “buddy” also thought this would be a good location for sunning. It was an interesting day and we enjoyed finally visiting the areas to see what they had to offer. 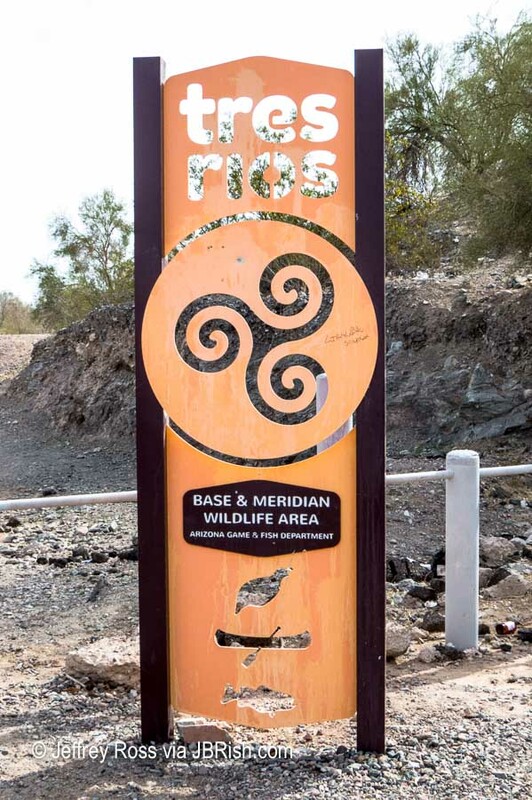 The Tres Rios Base & Meridian Wildlife Area hosts a number of events including nature awareness and bird watching opportunities. You can follow the along on their Facebook page to see what the upcoming functions offer. 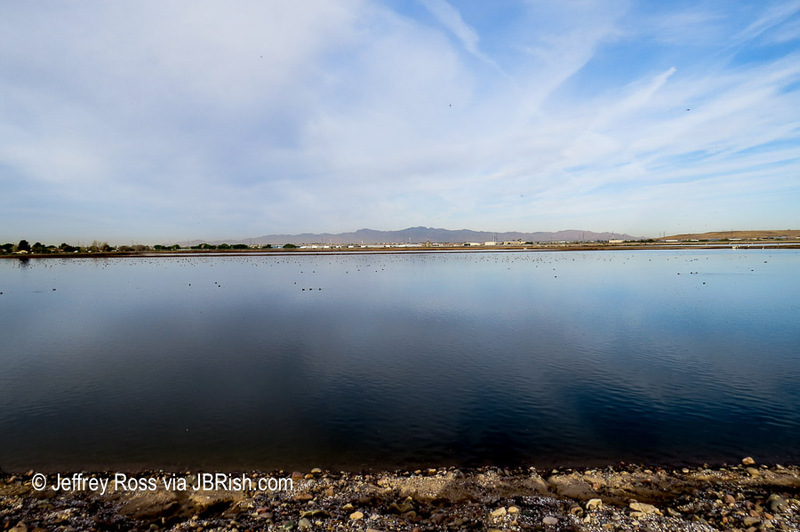 We had heard about the Glendale Recharge Ponds and the variety of birds they attract. As hikers and explorers, we decided we would head out that way to see what birds we could find. We started our jaunt early to have the best chance at seeing the most birds and while we thought it might be a bit tricky to find, the directions were actually quite good (see Part 2 for directions). Right away we saw the discharge for which the ponds were named. 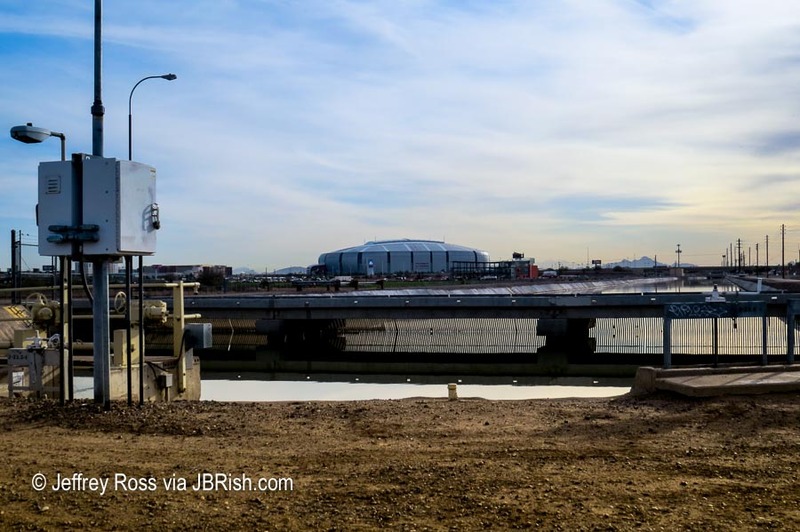 The facility is located west of and in a direct line with the University of Phoenix Stadium, home of the Arizona Cardinals football team. 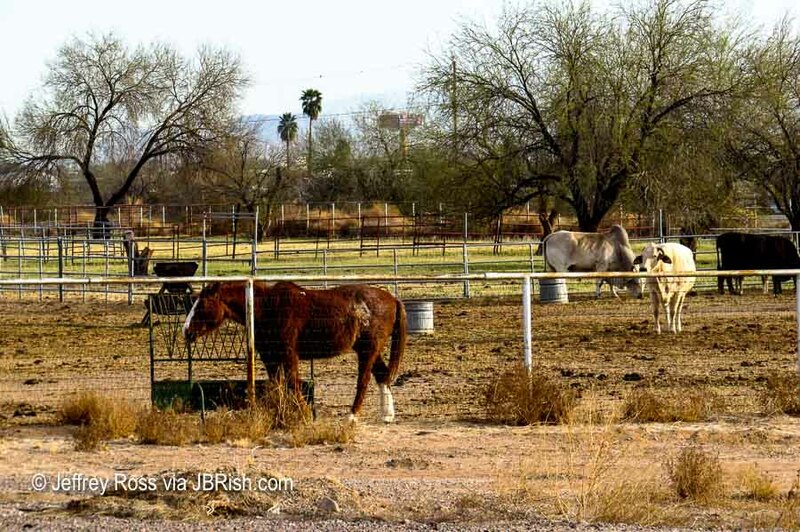 Along the access road leading to the ponds and along the sides of the waterways, there was a variety of farms and stables. Very quickly we noticed something very, very annoying – – flies. Loads and loads of flies. Perhaps gnats would be more accurate! 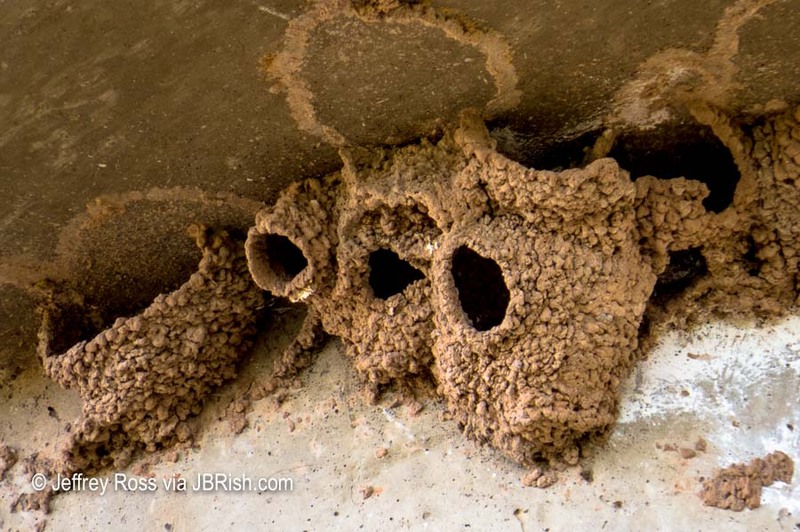 This might be very good for the birds, but not so pleasant for us. Can you see all those light brown specs in the picture above? 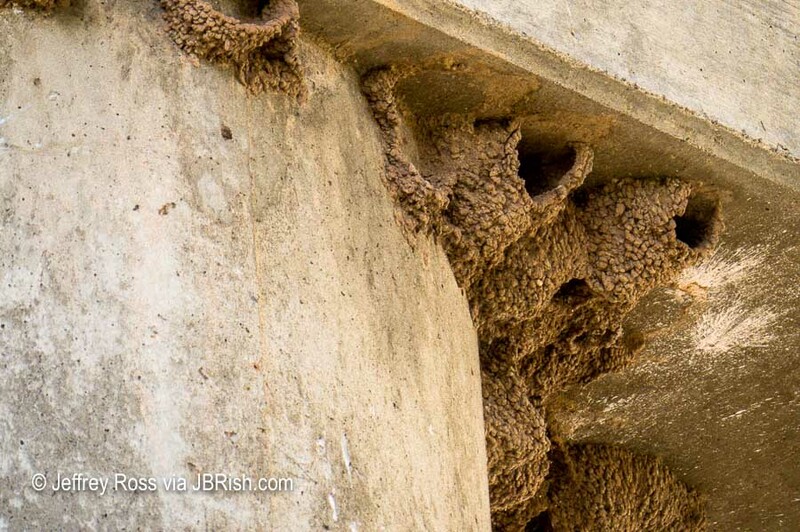 Those are some of the flies that were flitting around as soon as we left the confines of our car. Let me circle (in red) a couple for you. 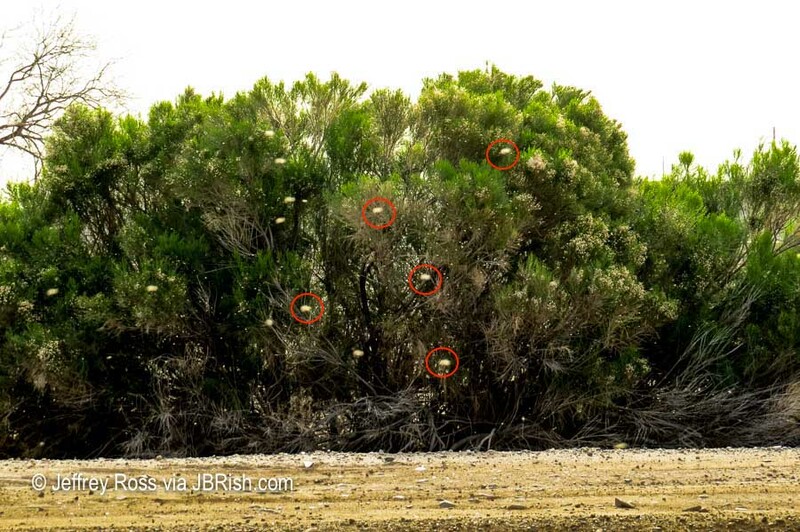 Only five were circled, but there were hundreds upon hundreds! We traveled for about an hour to get to our destination so we were not be deterred. A move perhaps we would later regret. Only a few short steps along the pathways we saw what I identified as a Cattle Egret. If you look closely on the neck you can see flies on the bird. Other gnats are also clearly visible on the bird. We hadn’t planned on most of the wildlife to be so far away. 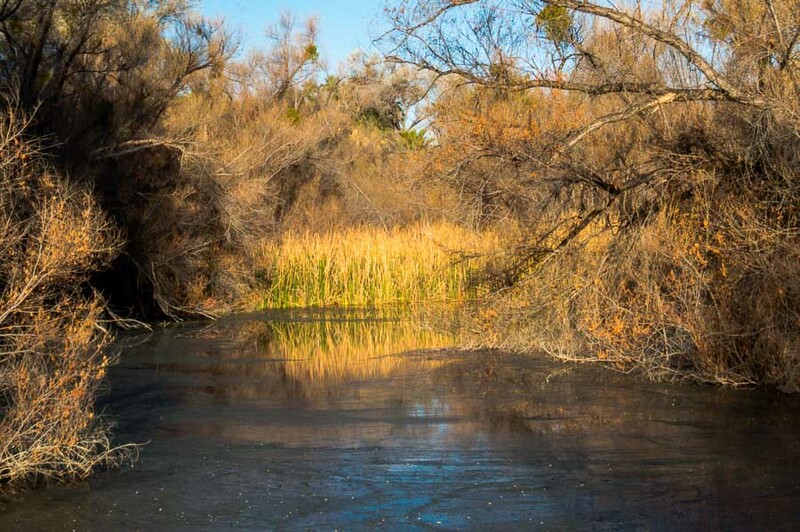 As we walked, the waterbirds swam to the far side of the large pond to seek safety and therefore escape our gaze. While I had three cameras with me, the only camera that was useful was the Canon SX50 HS with a large zoom lens. but because of their long legs! Now we know how they got their name! Lurking farther down the path and around the bend was an alert and somewhat wary Great Blue Heron. In several locations there were warnings about no fishing! 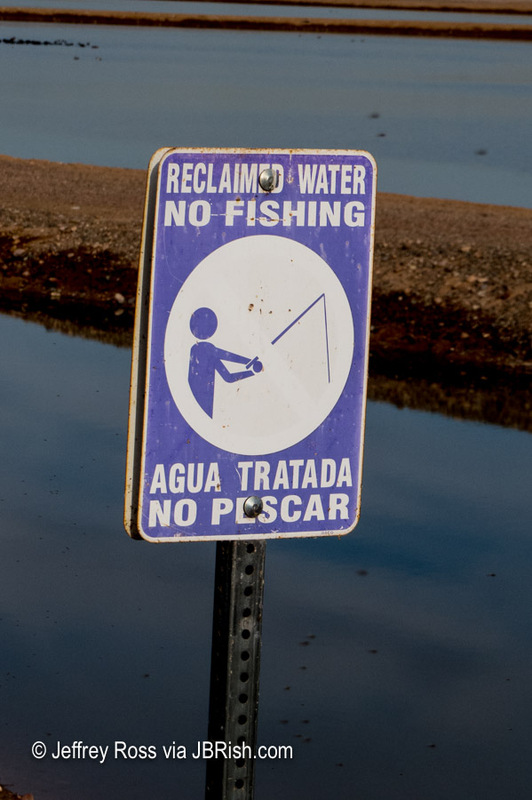 I have since learned that people do fish there even with the signs posted. There were many, many Coots in the ponds, but also in the group were several other water birds. 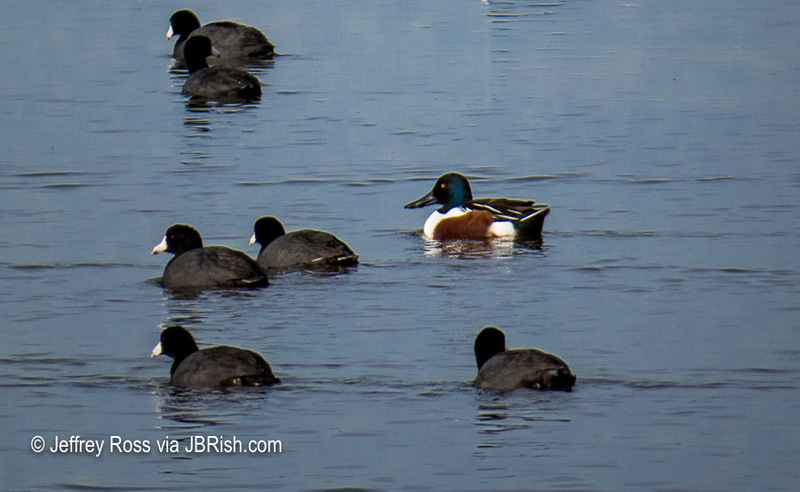 The male Northern Shoveler Duck was quite handsome. A Killdeer looked on with interest probably wondering what we were doing out-and-about with all these bugs in the air. Killdeer Eggs in Our Yard; Oh My! 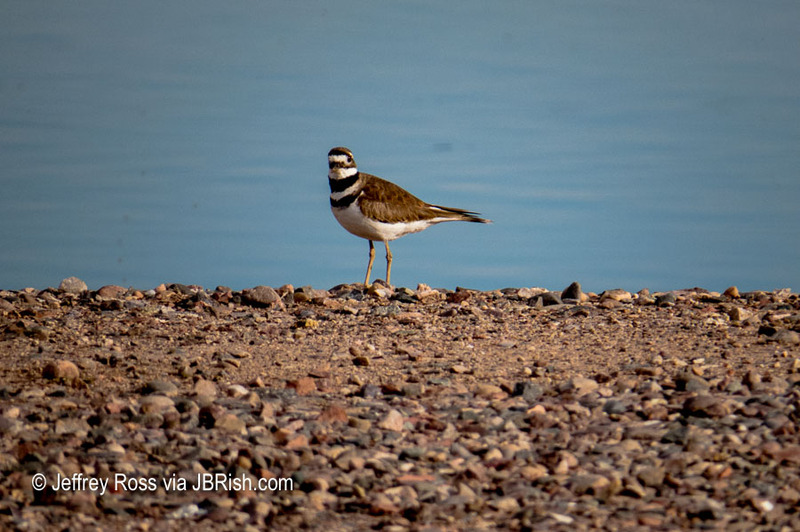 For more information about the Killdeer’s rearing process, you can read The Precocious Killdeer. Unfortunately, wherever people go, there are bound to be traces that they were there. 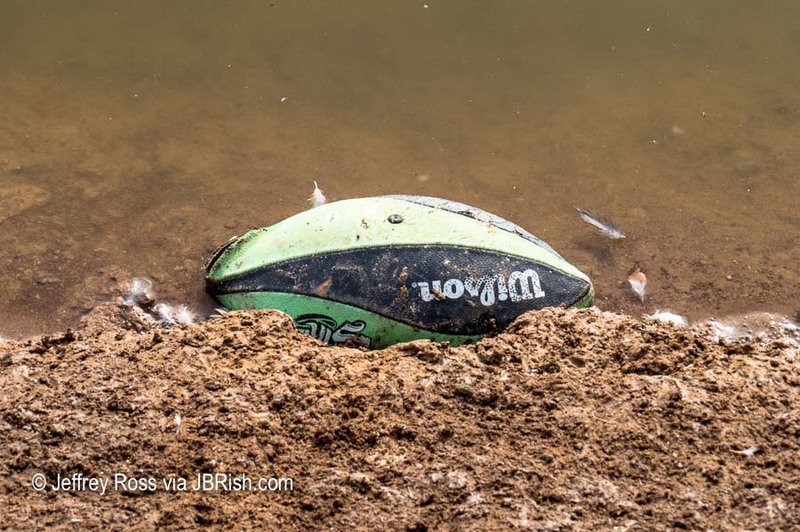 Whether intentional or not, we found a floating flip-flop and this football. Overall, however, there wasn’t too much debris. We continued to walk a while longer to complete the circuit around the one large pond nearest our car. We were becoming a bit uncomfortable trying to “chase down” the birds with all the bugs buzzing around. 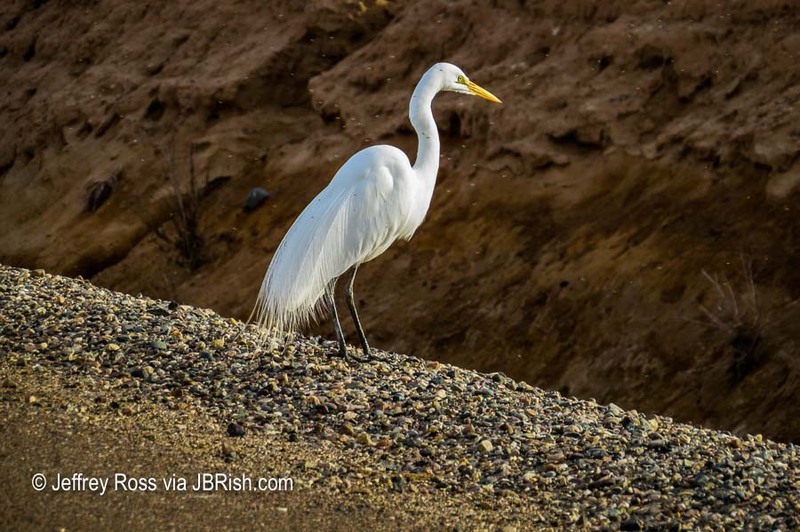 For casual bird watchers, identifying a particular bird can be quite a challenge. 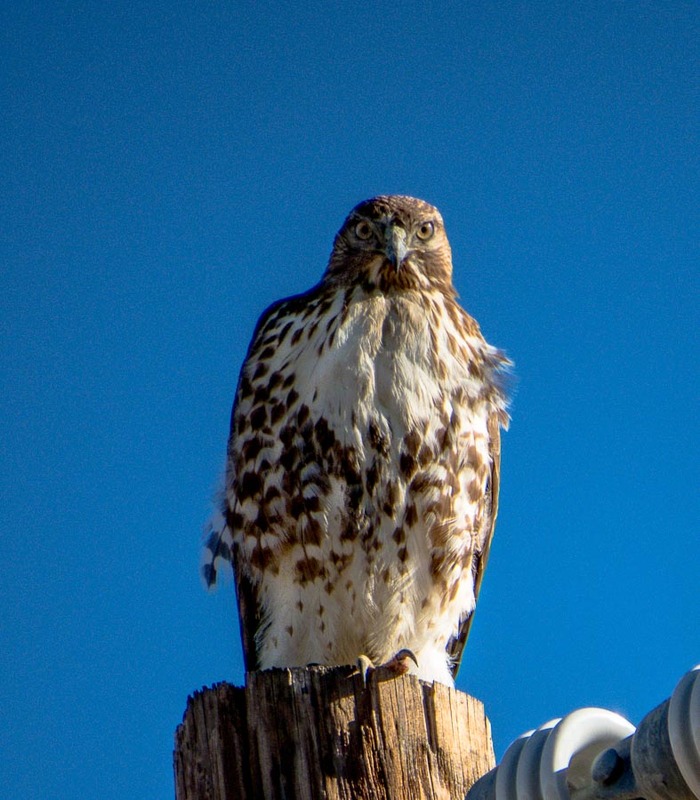 One would think that a Red-tailed Hawk would look very much like every other Red-tailed Hawk, but it isn’t quite that easy. Unfortunately, there are often variations on a theme. One problem, for example, is that a juvenile bird often looks quite different than it does as an adult. This can reveal itself with differnt feather patterns or colors or perhaps a less developed feature that, when the bird is mature, would be quite prominent. Facing this challenge, I often farm out the job of identification to the wonderful world of birders on the Internet. 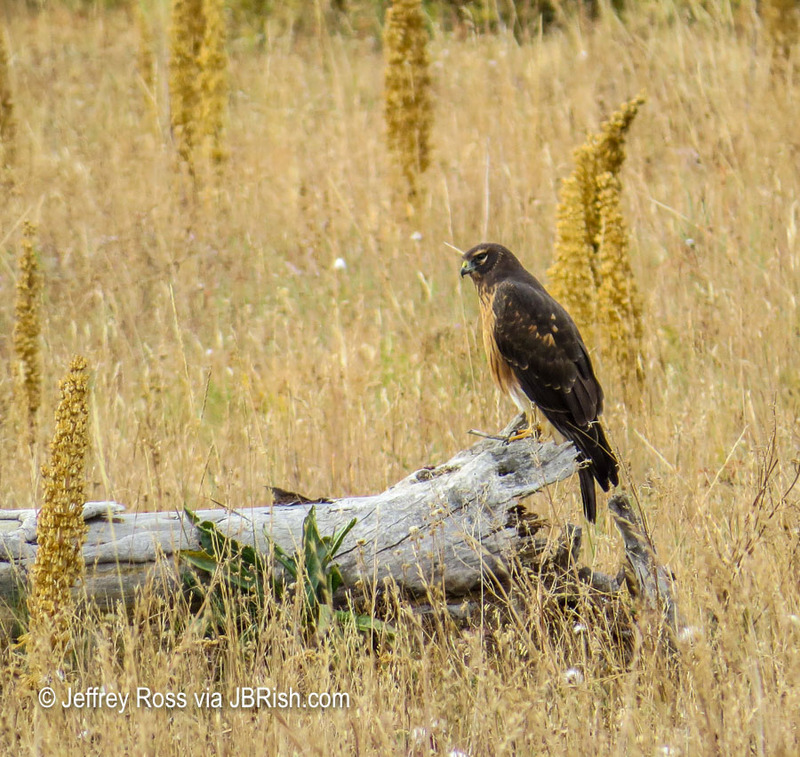 That is how I was able to determine that the bird below is a juvenile Red-tailed Hawk. 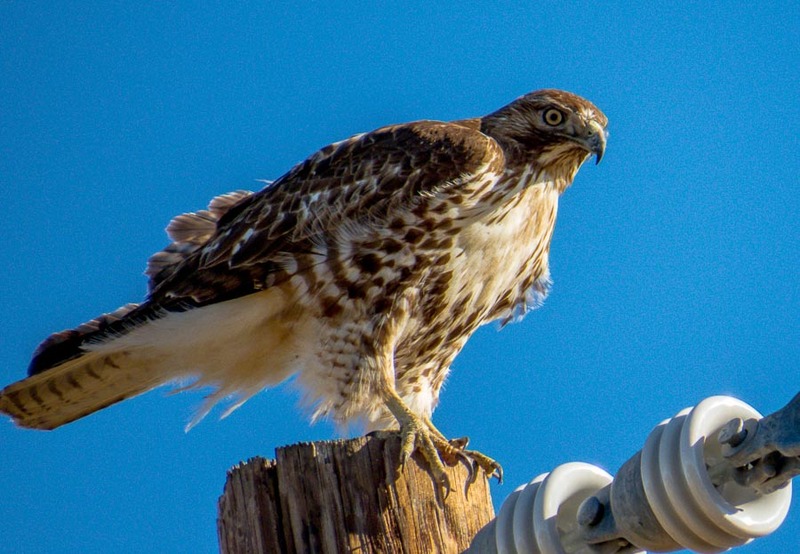 As you can see, we have a power pole near our house and very often one hawk or another will stop by to enjoy a meal or keep a lookout for the next one. While they are atop this perch, I am often able to walk close to them to capture a portrait. As I approached, the bird wanted to keep an eye on me. Here the bird decided to turn around to face me. 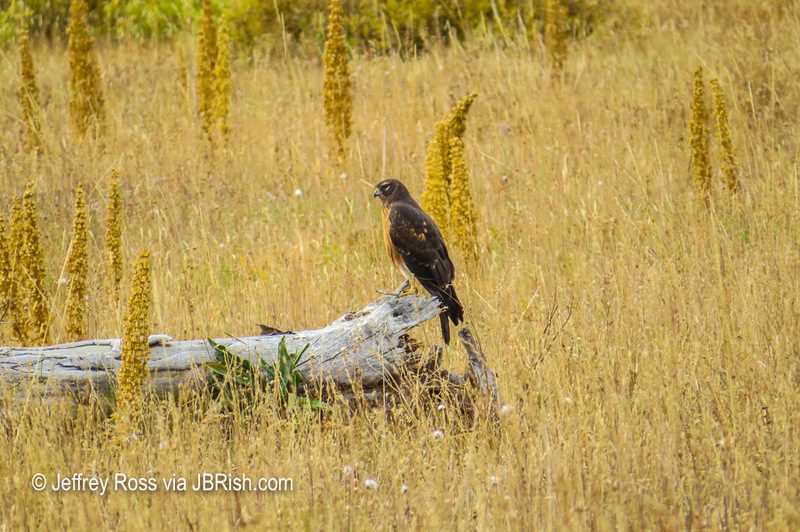 When approached, hawks don’t necessarily run away, but will often just stare back! 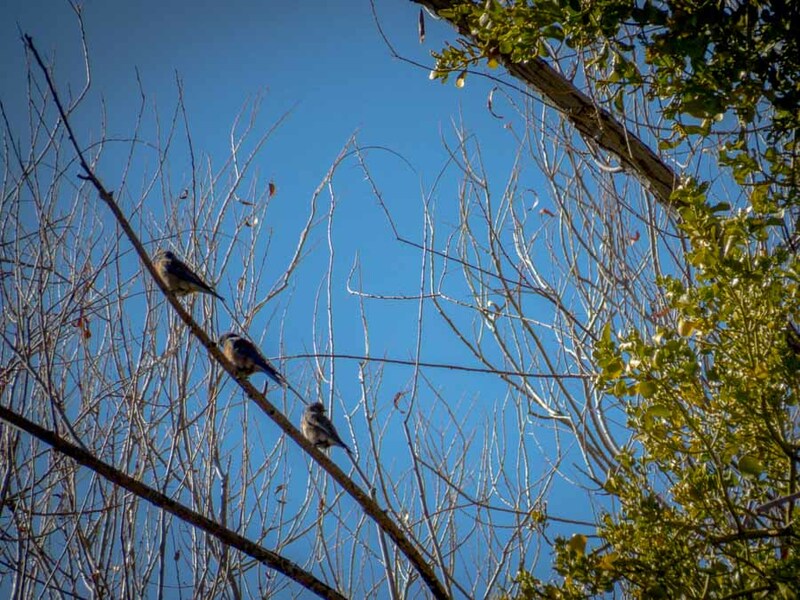 It was quite a while since we had a good dose of nature and the warmer than usual winter has given us added impetus to “go outside!” An opportunity presented itself which allowed us to combine two of our interests, bird watching and hiking. As I have explained on these pages before, I am an “occasional birder.” I enjoy birds and bird identification, but I am not ardent. I take it as it comes and it adds enjoyment to my wanderings. 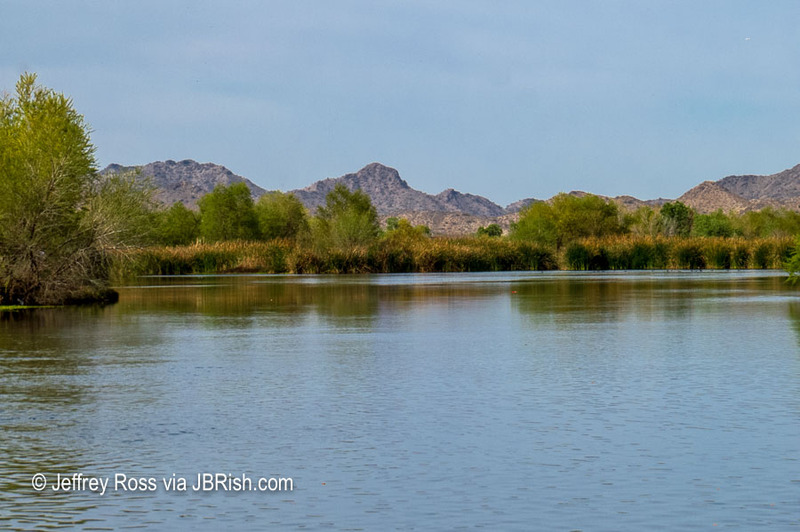 We registered for a guided bird walk at the Hassayampa River Preserve in Wickenburg, AZ. 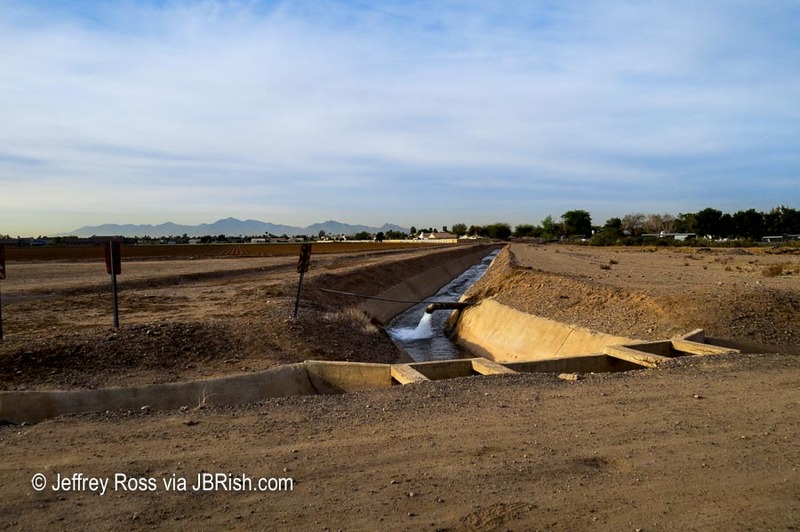 This is riparian zone that has running water all year long; a rarity for the desert. As such, many birds are attracted to this wooded environment. The warmer temperatures have brought featehred visitors that don’t usually come this far south during February. Below is an example of one of the frustrations. 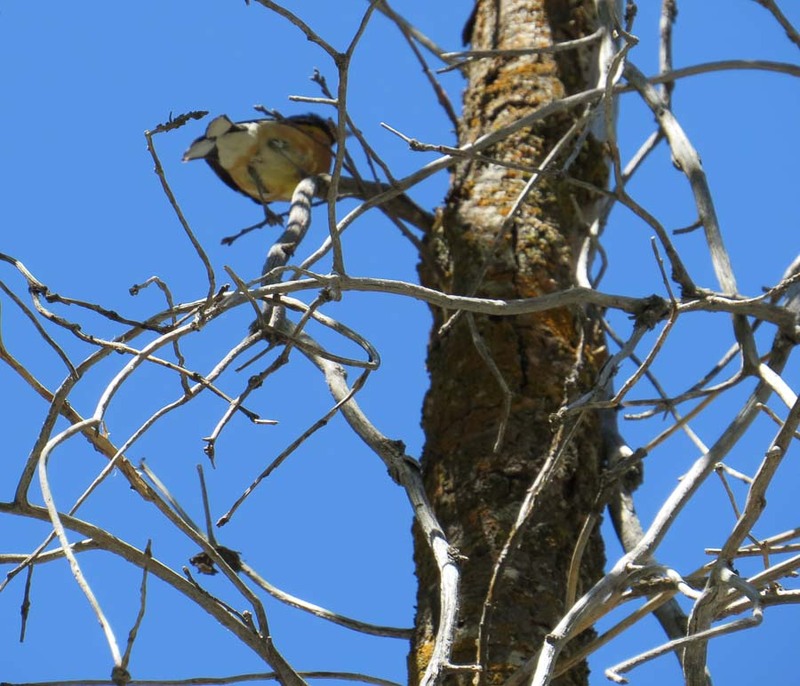 This bird appeared on the top of a nearby Cottonwood tree. It was vey much in view although quite a distance away. Unless an observer knew this bird from previous experience, it would be difficult to identify. I had seen this bird several times before so I knew it was a Phainopepla. One distinguishing characteristic is its red eye which, because of the distance and lighting, was not visible. The black tuft on top of the head is also a distinguishing feature. I was able to get my best picture to date of this bird in November. You can see it HERE. When I attended my first guided bird walk, I was surprised to learn that most birders don’t rely on sightings to identify the bird at first. They identify the call or song and then look for the specific bird. I must admit that this is a skill which mostly eludes me. 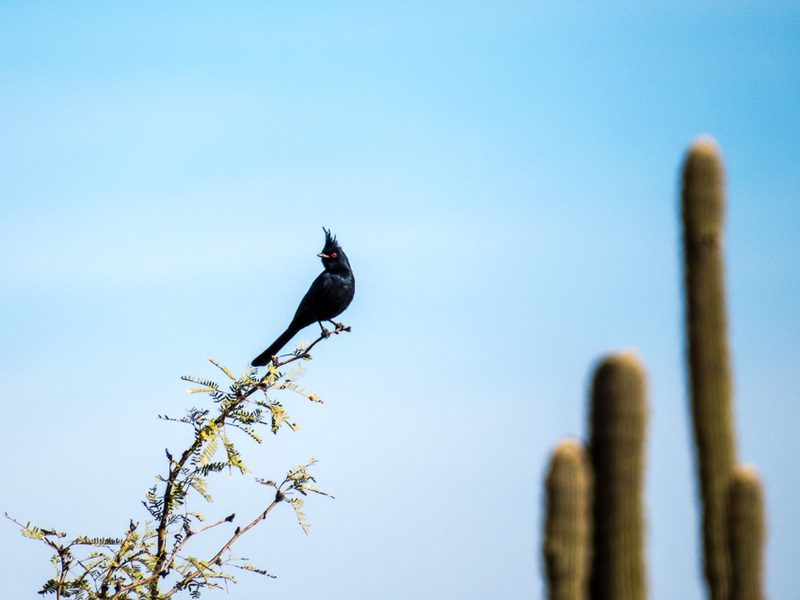 I do know certain very defined bird calls like the Mourning Dove, Cactus Wren, Curve-billed Thrasher, etc., but all those chip-chip-chips and too-wees just escape my grasp. This is one reason I greatly appreciate having a guide. 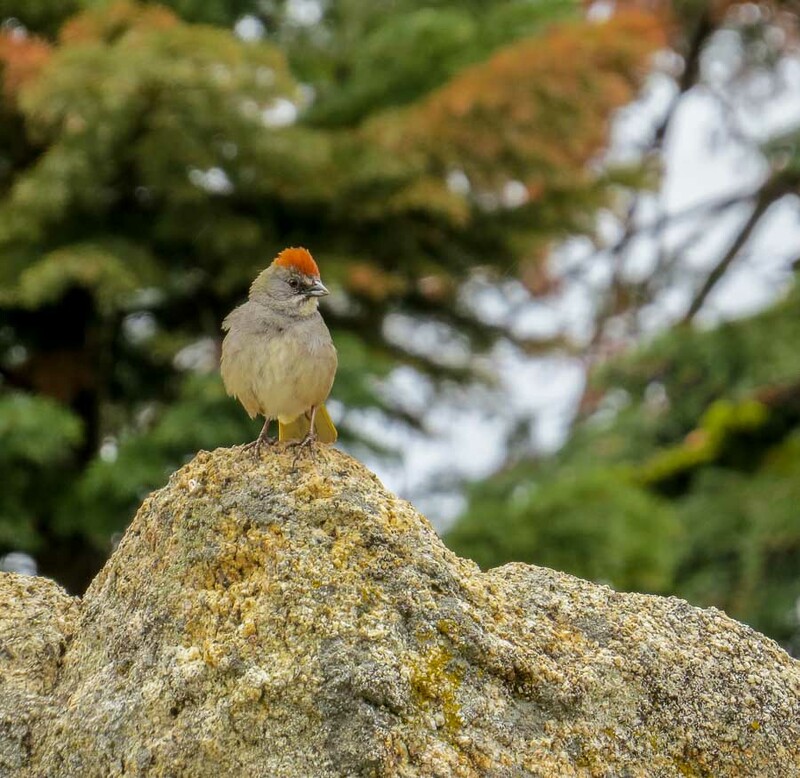 The bird in the picture below, for example, was identified as a Ruby-crowned Kinglet. The birds are particularly difficult to identify and even more so to photograph. They jump around incessantly. 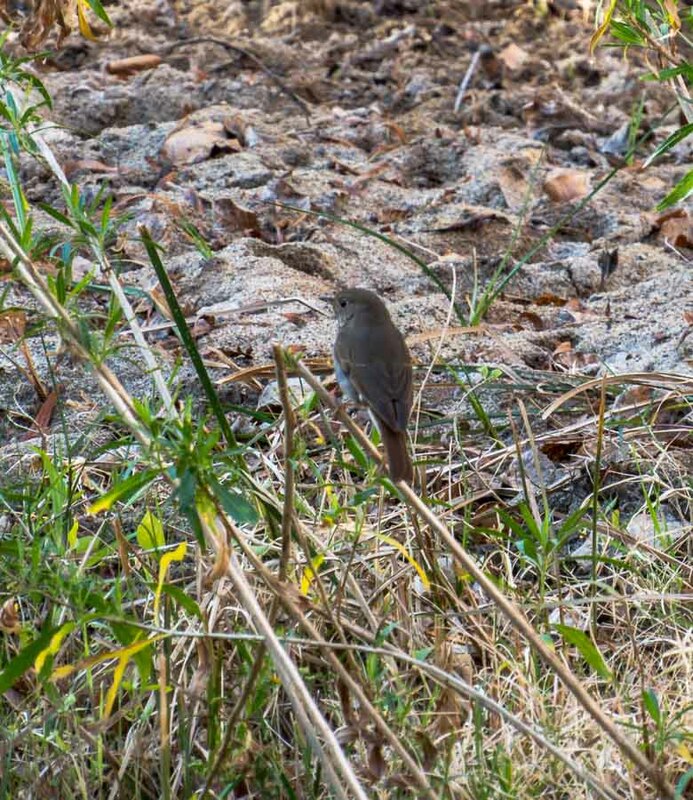 Although this bird is totally shaded, the guide followed it from several trees and was able to identify it for us. I take her word for it! Another photo of the Ruby-crowned Kinglet. The most distinguishing mark of this bird is a red tuft on the top if the head. The angle, lighting and other factors did not capture this marking. You can see much better photos of this bird HERE. There were some birds that were more conveniently situated and thus more easily identifiable such as this Hermit Thrush. The problem here is that the bird has very distinctive spots on its whiteish underbelly, but as you will note, that characteristic was not clearly visible from the back. The lesser Goldfinches were a bit more cooperative once the morning warmed a bit. They would cling to the thin branches of a nearby bush and pose for a while. 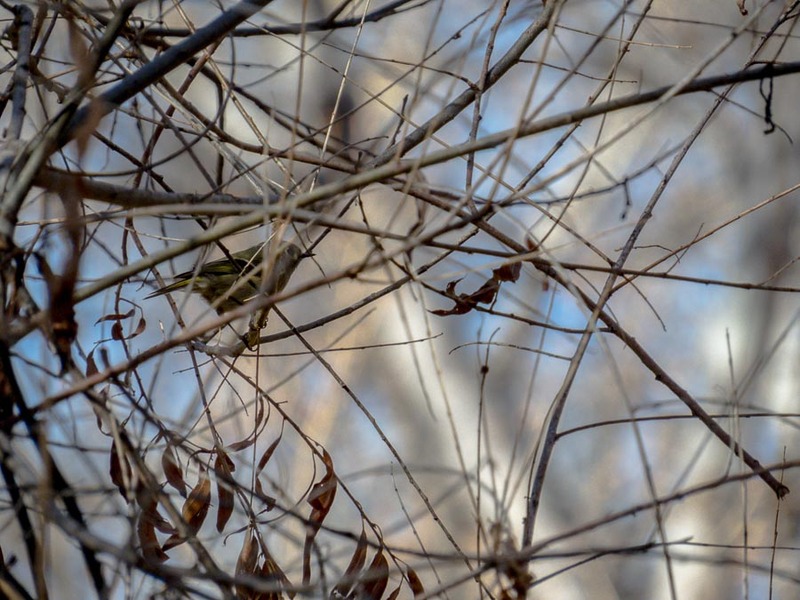 The trick here is to take a number of pictures as the autofocus (which I use for birding*) will sometimes choose to focus on a foreground branch and render the bird out-of-focus. 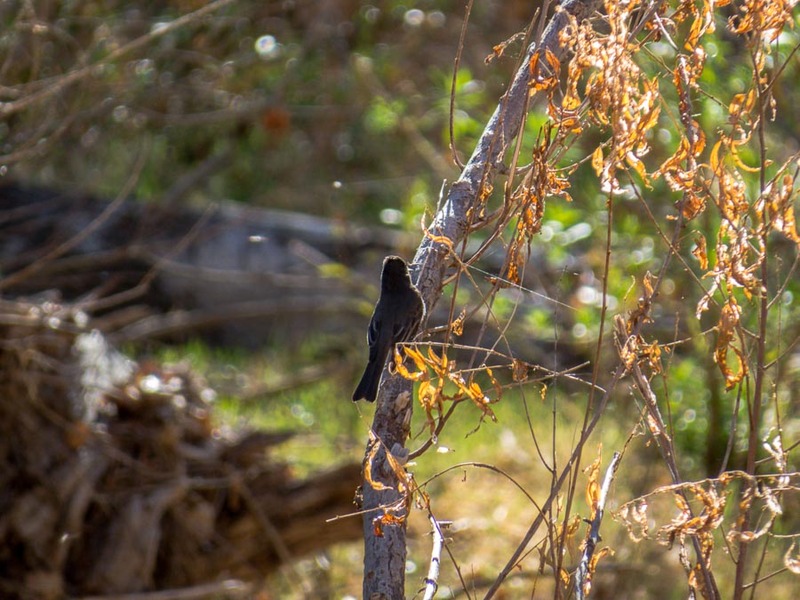 Black Phoebes often will flit away and then return to the same branch from which they flew so it may be easy to wait a moment while gaining focus on the perch and then snap the shot once the bird returns. The first shot has only the back of the bird, but it later turned sideways for a profile shot. 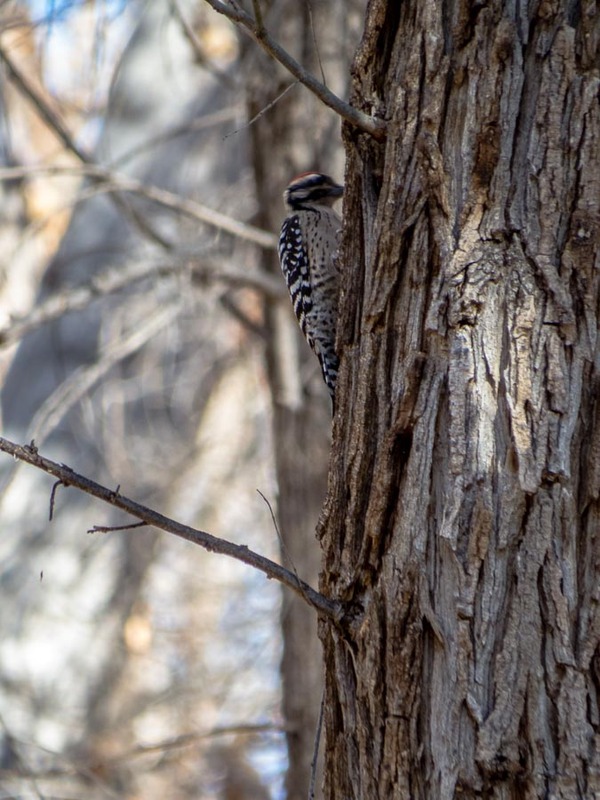 The next series is of a Ladder-backed Woodpecker. 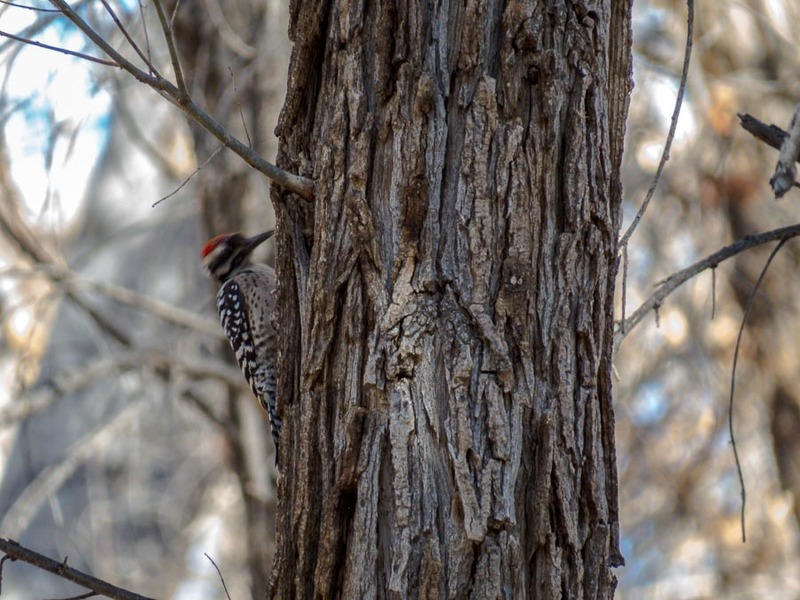 Woodpeckers, creepers and other similar birds cling to the side of trees and climb upward. They will then fly to a nearby tree and begin to hop while ascending that tree. 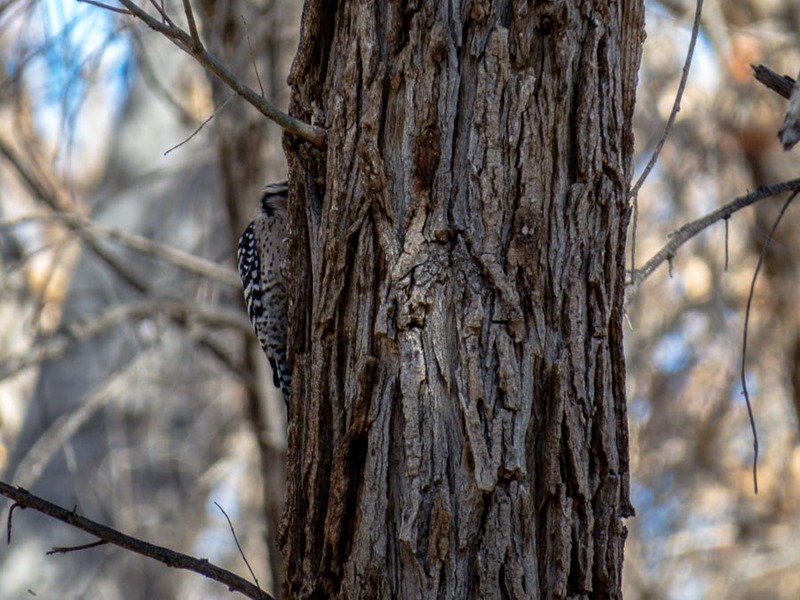 It appears to me that they know when they are being watched and they scoot to the side of the tree away from the viewer so they can hide. At least it seems that way! 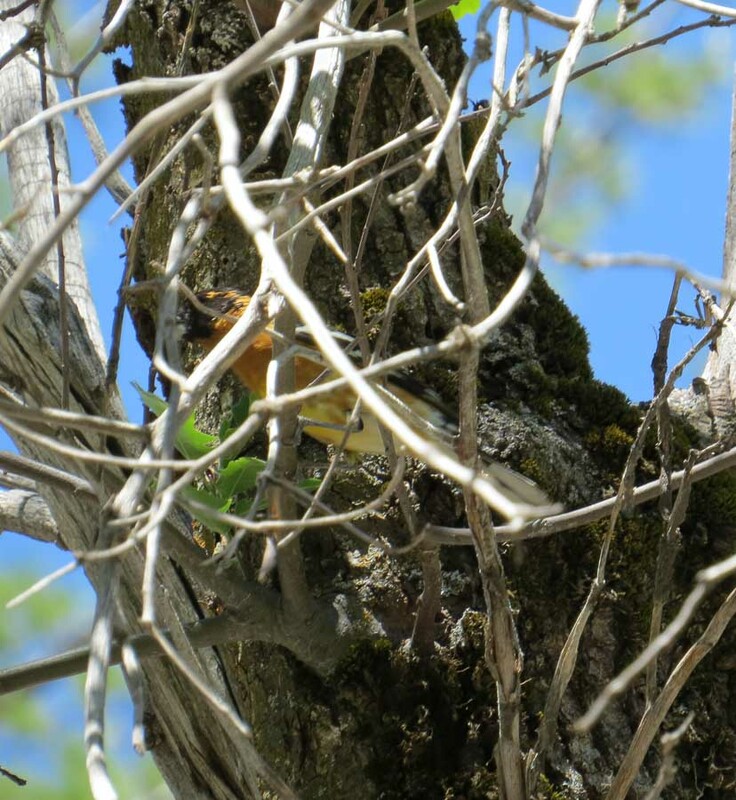 While the pictures are a bit blurry because the bird was madly pecking away, the distinctive markings are visible. One last sighting before we left revealed three Western Bluebirds sitting on the same branch. They were catching the mid-morning rays of the sun. 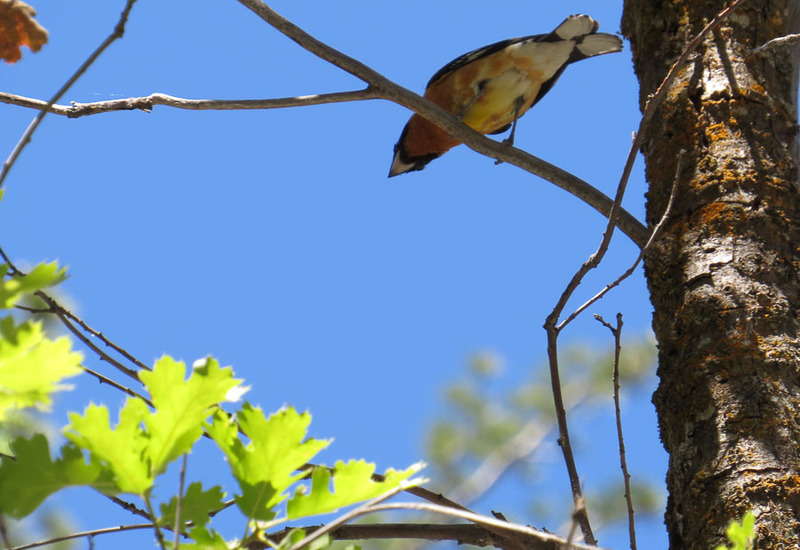 The blue of their backs does not show that well, but the rufous color of their underside is clearly visible. * NOTE – The only camera I used during this bird walk was my Canon SX50 HS which is a bridge camera with a telephoto zoom lens. Pictures are best at low ISO (200 and below) which limits the aperture and shutter speed. The aim of these photographs was not to capture beautiful pictures of birds, but to take pictures that would enable identification. Of course it would be wonderful to have an excellent photo along the way! NOTE – “As Shot” photographs are some that I have posted on Instagram, but without any unwarranted imposed crops, less detail reduction and more of an explanation. Tom shows his colors when is around the hens – Happy Thanksgiving – 2017! 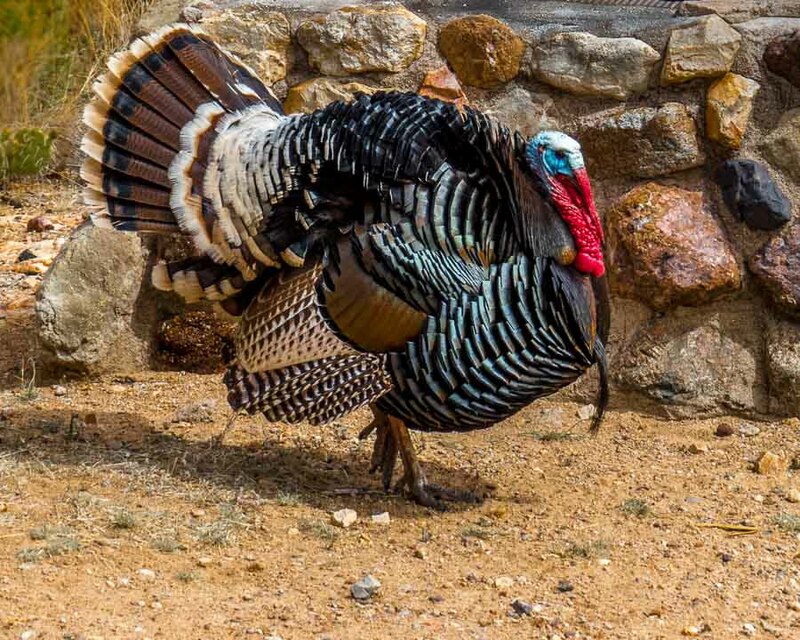 On a hiking trip to Brown Canyon in Buenos Aires National Wildlife Refuge, southern Arizona, we were treated to a display by this Tom Turkey who was parading around in front of two hens. Yesterday was an interesting day for me as the weather prediction was not excellent, but still fair and relatively mild with a predicted high in the low 80’s and we were eager to take a hike. We decided to select a route off of the Granite Mountain Trailhead (The Bootlegger Trail) which is part of the McDowell Mountain Preserve. 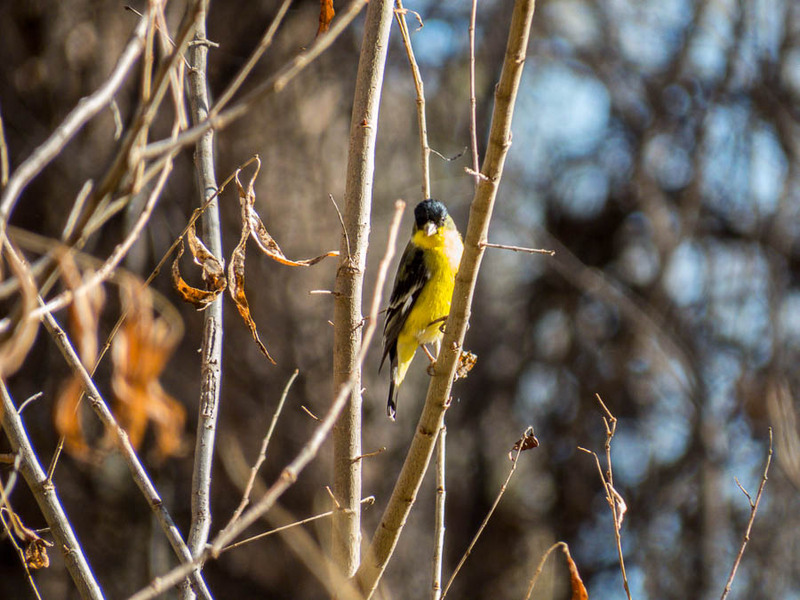 Whenever I hike, I anticipate capturing a picture of a bird that is either better than one that I currently have of that bird or, as a bonus, a bird for which I do not have a picture. 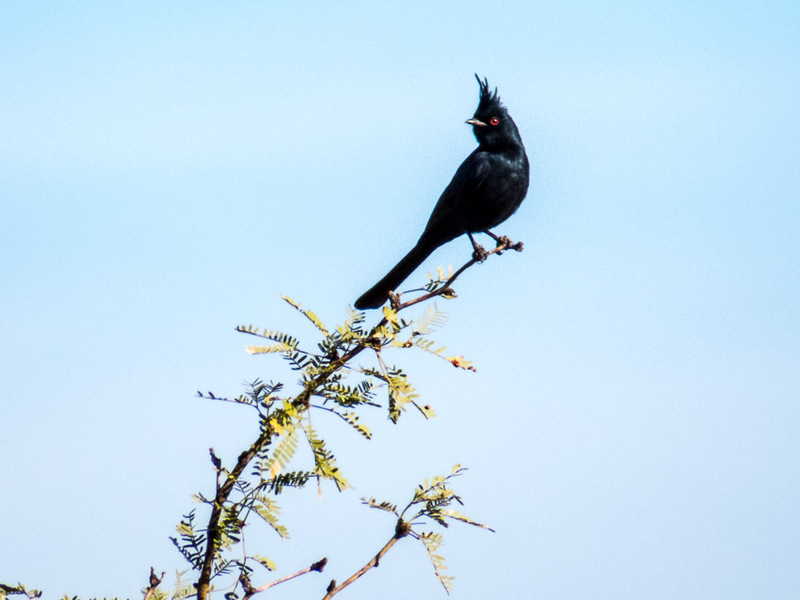 I have seen many Phainopeplas, but I have never been able to take a good picture of one. I also know that this is the time of the year that they visit the Sonoran Desert. I spotted one just 100 yards from my backyard a few days ago, but it was not in a very nice setting so I passed. 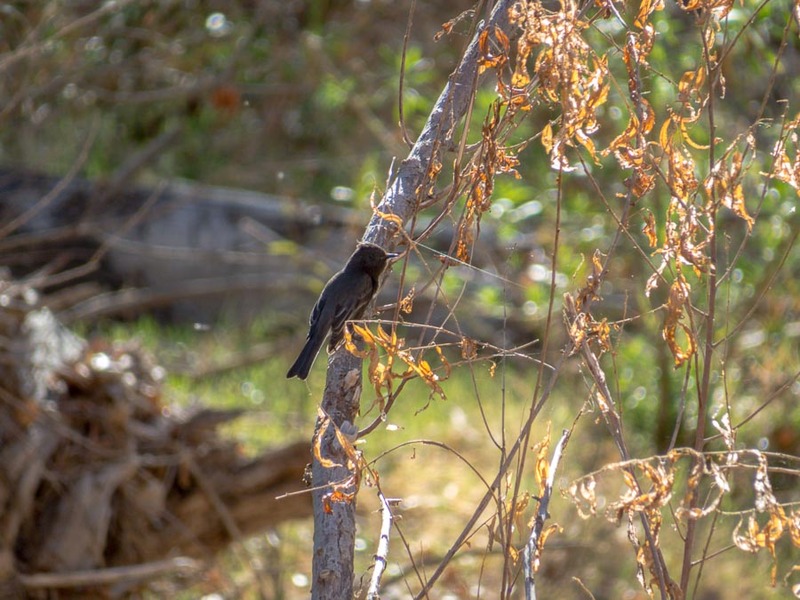 Today I was able to take a “starter picture” of a Phainopepla that we spotted along the Bootlegger Trail. I am labeling this a starter because I am hoping to capture a photograph that is even better one of these days! 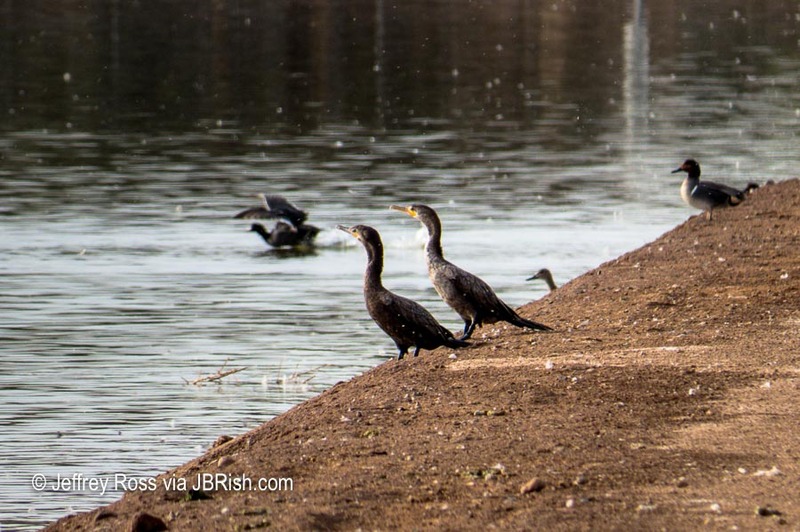 As I have stated on this blog before, I am an amateur photographer with very limited bird photography experience and just a bit more as a birder. The only camera I have with a long reach is my Canon PowerShot SX50HS and that is the equipment I used for the shot below. Phainopeplas remind me of Cardinals or Waxwings because of their sleek profile and the tuft. Males are black while females are more grey. Interestingly enough, they have a red eye which is very striking and not always easy to capture in a photograph. I am placing a cropped image below to show more detail even though it may not be as sharp as I would like. Now I have one more picture for my collection! I think humans like to look at other living creatures and assign to them characteristics of our own species. We anthropomorphize other living things. We immediately understand that animals feel fear and love of some kind. I am not sure if all non-human animals share a sense of curiosity, but some obviously do. Dolphins, whales, primates, etc have all demonstrated behavior we would tend to classify as curiosity. I have found that some birds are curious as well. 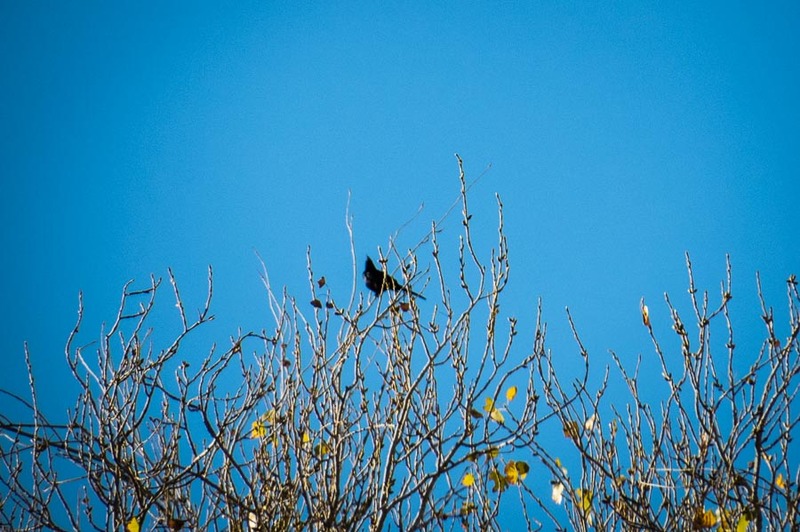 In the picture above, there is a bird sitting far away from where we were standing. Because of my interest in birds, we stopped to watch it for a while. You can’t make out the bird in the yellow circle in the photo above, but there was a very pretty bird sitting on that rock. A bird I had never seen before. It took me a while to get out my superzoom camera and take a closeup of that particular bird, but here it is. 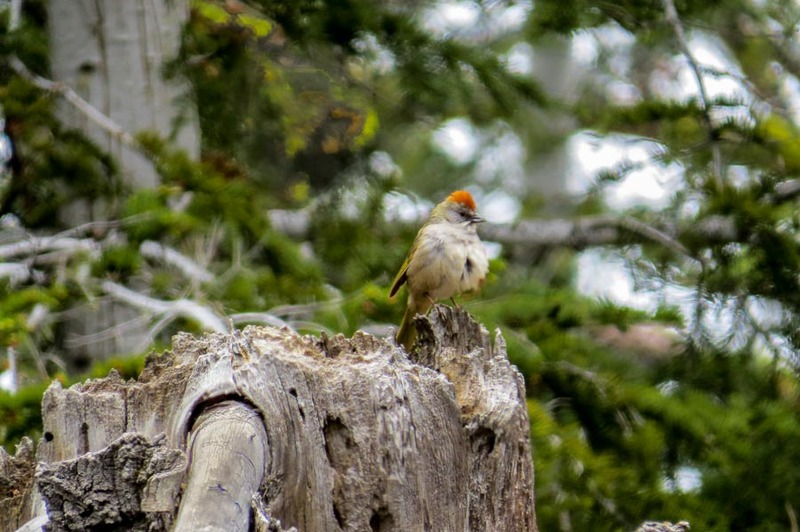 As we rested a good number of yards away, sitting on a rock, the bird continued to flit around, but at one point it landed on a tree stump that was only about twenty feet away; relatively close for a wild creature. I had the distinct impression that this bird was curious about us and what we were or weren’t doing. Since we were sitting quietly watching the bird, taking a drink and resting, I think the bird realized we had no bad intentions and it took chances to come close to us. It didn’t “park” there or stay very long in any one spot, but it did fly away and then come close again. Eventually we packed up and moved on. Later I was able to identify this bird as a Green-tailed Towhee. This is one of the prettier birds I have seen with it’s red-orange tuft atop. We were enjoying a beautiful hike through Zumwalt Meadow in Kings Canyon, CA observing all of the plants, scenery and wildlife we encountered. 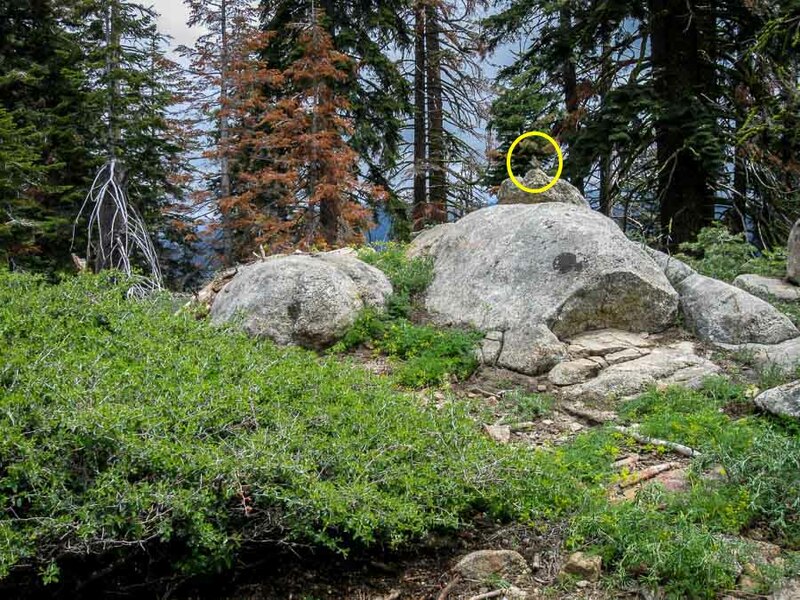 Keep in mind that much of this trail has tree roots, rocks, boulders, fallen branches, etc. so keeping eyes ahead or up is not an option for those hiking along. We would stop when a sudden motion or noise caught our attention or we just wanted to gaze at the scenery. We are avid gazers and thus would probably be considered somewhat pokey when it comes to the more speedy hikers. 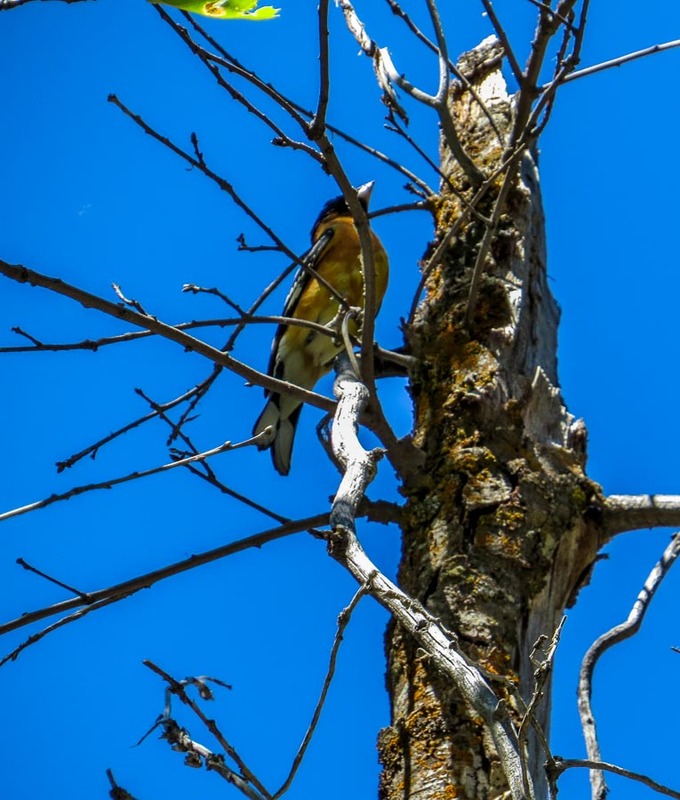 But I digress… We were climbing upward through a somewhat narrow corridor formed by boulders on either side and ahead, no more than twenty feet away, an attractive multi-colored bird landed in a tree. I was almost sure this was one that I hadn’t identified yet so of course I was very interested in photographing the bird for future identification. The bird was mostly black, with orange-brown sides, a buff bottom and rump with white markings on black wings. The face also had some blotches of other colors as well. Immediately I thought this was an oriole of one type or another. 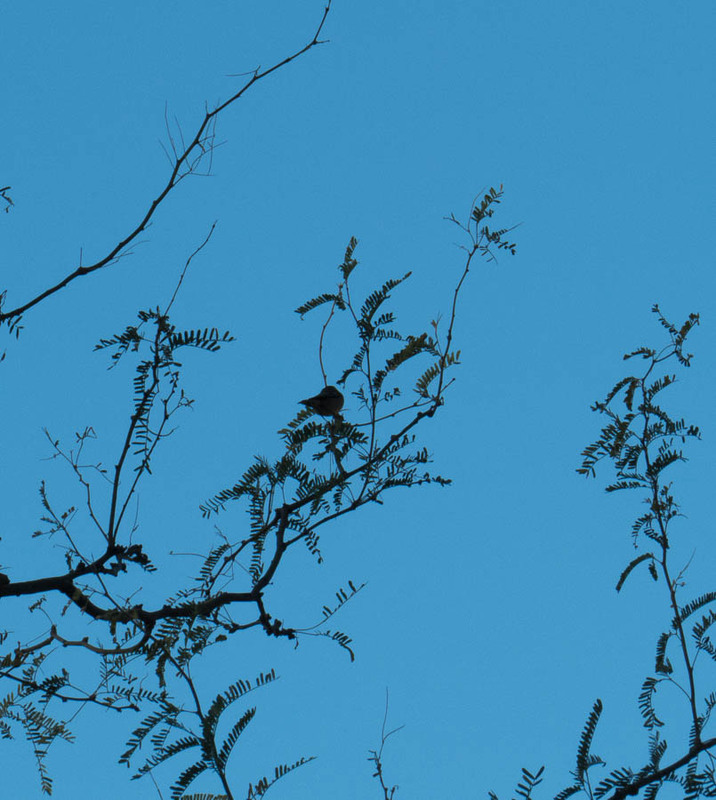 By the time I was able to stop and take note, the bird was flitting from branch-to-branch and this (above) was the first photograph I was able to capture. Hmmmm – pretty hard to ID from that shot. What was infuriating was that the bird would jump down closer to me, let’s say eight feet away, but would be among a mass of branches; drats! There was one instance, when the bird was just above my head and I got a good luck at its rump and underparts. Although the bird was skittish, it appeared to have a certain curiosity as it lingered in the area for a long time; in bird minutes! In the field it is hard to tell exactly how good the photographs are and whether or not there would be enough information to piece an identification together, but using all of the photos, I believe I was able to correctly ID the bird. Looking at my less than stellar photos, I was able to locate most of the same markings. 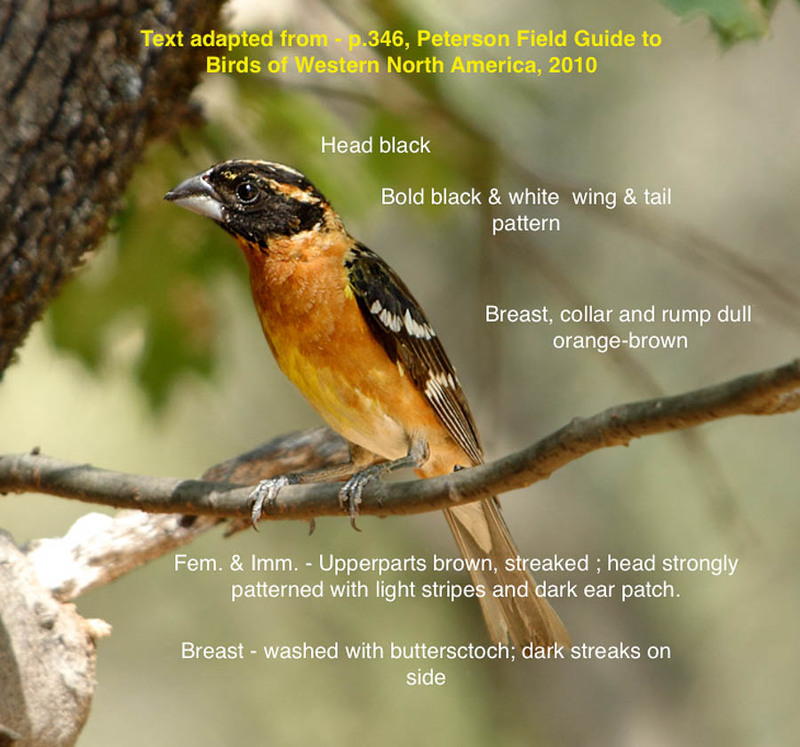 For those new to birding, keep in mind that males and females often have different markings and colorations. I knew this wasn’t an oriole as I originally suspected primarily because of the shape of the beak. An oriole would have a much more pointed beak. NOTE – This is why I like to take multiple photographs and work the identification at my leisure. What are your thoughts? Leave them in the comment section below. 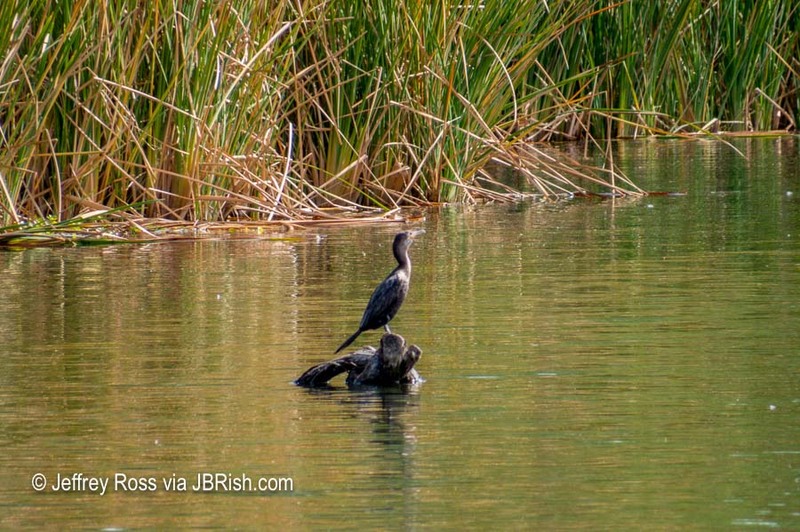 To read more JBRish.com posts about birds or birding, click HERE.